Tetworld� is seeking and developing the Ways and Means to achieve its goal of "Making the World Work for Everyone" and "Peace Through Integral Development". Based upon the life's work, knowledge and vision of the late, R. Buckminster Fuller--his discovery of Cosmic Plenitude; and his concept and design for a world game to address the question of how to deploy Earth's resources and potential to the advantage of all-humanity--the Tetworld Center for Peace Through Global Gaming and its Tetworld Global Game, is dedicated to "Making the World Work for Everyone". �"To start with, here is an educational bombshell: Take from all of today's industrial nations all their industrial machinery and all their energy-distributing networks, and leave them all their ideologies, all their political leaders, and all their political organizations and I can tell you that within six months two billion people will die of starvation, having gone through great pain and deprivation along the way. "However, if we leave the industrial machinery and their energy-distribution networks and leave them also all the people who have routine jobs operating the industrial machinery and distributing its products, and we take away all the industrial countries all their ideologies and all the politicians and political machine workers, people would keep right on eating. Possibly getting on a little better than before. "The fact is that now -- for the first time in the history of man, for the last ten years, all the political theories and all the concepts of political functions-in any other than secondary roles as housekeeping organizations-are completely obsolete. All of them were developed on the you-or-me basis. This whole realization that mankind can and may be comprehensively successful is startling. "In pursuance of this theme...we are going to undertake...a very extraordinary computerized program to be know as 'How to Make the World Work'...We are going to introduce the many variables known to be operative in economics. We will store all the basic data in the machine's memory bank; where and how much of each class of the physical resources; where are the people, what are the trendings-all kinds of trendings of world man? "Next we are going to set up a computer feeding game, called "How Do We Make the World Work'...We will bring people from all over the world to play it. If a team resorts to political pressures to accelerate their advantages and is not able to wait for the going gestation rates to validate their theory they are apt to be in trouble. When you get into politics you are very liable to get into war. War is the ultimate tool of politics. If war develops the side inducing it loses the game. "Essence of the world's working will be to make every man able to become a world citizen and able to enjoy the whole earth, going wherever he wants at any time, able to take care of all the needs of all his forward days without any interference with any other man and never at never at the cost of another man's equal freedom and advantage. I think the communication problem--of 'How to Make the World Work'--will become extremely popular the world around. "...'The game' will be hooked up with the now swiftly increasing major universities information network. This network's information bank will soon be augmented by the world-around-satellite-scanned live inventorying of vital data. Spy satellites are now inadvertently telephotoing the where-abouts and number of beef cattle around the surface of the earth. The exact condition of all the world's crops is now simultaneously and totally scanned and inventoried. The interrelationship of the comprehensively scanned weather and the growing food supply of the entire earth are becoming manifest. "In playing 'the game' the computer will remember all the plays made by previous players and will be able to remind each successive player of the ill fate of any poor move he might contemplate making. But the ever-changing inventory might make possible today that which would not work yesterday. Therefore, the successful stratagems of the live game will vary from day to day. The game will not become stereotyped. "If a player resorts to political means for the realization of his strategy, he may be forced ultimately to use the war-wagering equipment with which all national political systems maintain their sovereign power. If a player fires a gun--that is, if he resorts to warfare, large or small--he loses and must fall out of the game. "The general-systems-theory controls of the game will be predicted upon employing within a closed system the world's continually updated total resource information in closely specified network complexes designed to facilitate attainment, at the earliest possible date, by every human being of complete enjoyment of the total planet earth, through the individual's optional traveling, tarrying, or dwelling here and there. This world-around freedom of living, work, study, and enjoyment must be accomplished without any individual being physically or economically advantaged at the cost of another. "Whenever player or team first attains total success for humanity wins the first round of the gaming. There are alternative ways of attaining success. The one who attains it in the shortest time wins the second round. Those who better the record at a later date win rounds 3, 4, and so on. "All the foregoing objectives must be accomplished not only for those who now live but for all coming generations of humanity. How to make humanity a continuing success at the earliest possible moment will be the objective. The game will also be dynamic. The players will be forced to improve the program--failure to improve also results in retrogression of conditions. Conditions cannot be pegged to accomplishment. They must also grow either worse or better. This puts time at a premium in playing the game. "Major individuals and teams will be asked to play the game. The game cannot help but become major world news...the game will be visibly developed and may be live-televised the world over by a multi-Telstar relay system. You are cordially invited to acquaint yourself with our purpose, vision and programs. Tetworld's concept for a global gaming center is in actuality a global observatory. That's exactly what it is--an observatory! The only difference is that rather than looking outward toward the stars, we are looking inward at Spaceship Earth from a place (in space), outward from the earth. It's as if we turned the Hubble Space Telescope towards the earth--and instead of observing a planet rotating at 1,000 miles per hour, we are able to see the entirety of earth at a single moment (ala the Dymaxion Earth Display Map as shown below). Where one can go and view and study conditions aboard the planet.The huge computing and display capabilities of the observatory will enable us to see where all the people and resources are, where the crops are today, where they were last year. Project conditions for next year. Where are the wind and hydropower resources--view migration patterns--watch planetary deforestation unfold before your eyes. Posit "what ifs". What an extraordinary resource it will be! 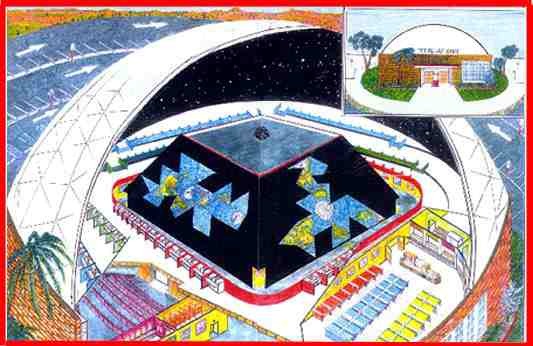 A global, planetary, earthian observatory of earth itself. Quite apart from its integral value to global gaming--it stands alone as a needed, unique and vital resource for the planet. Please click this link to see a larger view of the Earth Observatory & Gaming Complex, and images/animations of Buckminster Fuller's Dymaxion Projection Air/Ocean Map--our "gameboard"
Tetworld & the TetGlobalGame are inspired by the concept of a global (world) game, as described by R. Buckminser Fuller, in his books, "Utopia or Oblivion", "Operating Manual for Spaceship Earth" and "Critical Path", in which he proposed the idea that teams and players from around the world, gather (on the Internet and at a gaming complex) to "play" a computer-based game with the objective of "Making the World Work for Everyone"--for 100% of humanity. The Tetworld Project and TetglobalGame are presented for your consideration. Diagram 1 above, is of a tetrahedron (a geometric polyhedron with 4 faces), and it is the Tetworld conceptual "gameboard"---also look at the "quadtet" link which is to be found at Node D . Once at Node D, use the "quadtet" link. Explanations of how the information vectors operate in the Tetworld Tetrahedron System Design, will be found at the "Tetworld Story" link in the links section --and also at Node D.
While Tetworld's: The Quadtet Systems Design for Organization and Operations (QSD), was first designed and developed by the founder of the Tetworld Project in 1980, it had not been possible to provide at the Tetworld site, an animated, fully dimensional representation of the system, until late August, 1999, when it was learned that a tetrahedronal system design animation existed at the Lufthansa Systems Design Group webpage. 1. The Tetworld, TetGlobalGame is currently in various stages of development. 2. How to play? Here's one way: Players form 4 teams. Team 1 is responsible for Goals and Policy; Team 2 will be responsible for developing and conducting problem solving Strategies; Team 3 will be responsible for developing and contextualizing Data and Information Resources; Team 4 will be responsible for 2-way Communications between the Game and the external world. 3. Each Team will communicate with team members and the other Teams via the Internet. 4.. "Think Globally, Act Locally." Currently a Tetworld member is developing a TetGlobalGame project to use General Systems, the Tetworld system and systems theory perspectives, with players focusing their efforts locally, i.e., on the country of Belize, Central America. If you are interested in joining this project, please click the Belize link below to go to the "Tetworld Visits Belize" page. Please click this link to visit the Tetworld Home Page. Please click this link to visit the Tetworld Mission Page. Buckminster Fuller introduces the concept of a Spaceship called Earth. Nearing 88, Buckminster Fuller reviews the lessons and insights of a lifetime. We don't yet have our own capability to display the system using Java animations, so we are using Lufthansa's--just overlay Nodes A,B,C,D at the appropriate place--be patient while the page loads.